Xiaomi launched the Redmi Note 2 in China last week. The phablet went on sale yesterday, and the company managed to sell 800,000 handsets in just 12 hours, creating a record of sorts. 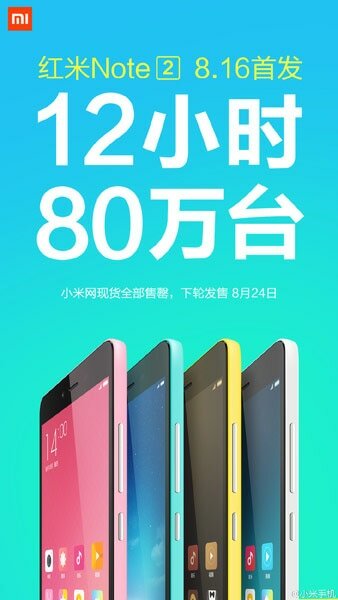 Xiaomi announced its record-breaking feat on Weibo, and also announced that the phablet will go on sale again on August 24. Before that, Xiaomi is hosting a global launch event in New Delhi on August 19, where it will release MIUI 7. You can check out all the new features arriving with the new ROM here. Additionally, Xiaomi is also widely expected to launch the Redmi Note 2 in India as well. Xiaomi launched the Redmi Note 2, alongside the Redmi Note 2 Prime in China last week. The former is priced at RMB 899 (Rs 9,103 approximately), while the slightly better variant is priced at RMB 999 (Rs 10,100 approximately). The phablet features a 5.5-inch 1080p display, 2GHz MediaTek Helio X10 octa-core 64-bit processor, 2GB of RAM, and 16GB internal storage. The Redmi Note 2 Prime, on the other hand, is powered by a 2.2GHz MediaTek Helio X10 octa-core 64-bit processor and features 32GB internal storage. The phablet also features a 13-megapixel rear camera, 5-megapixel OmniVision selfie camera, 3,060mAh battery, and connectivity options like dual-SIM card slots, 4G LTE support. On the software front, it runs on Android Lollipop-based MIUI 7 out-of-the-box.